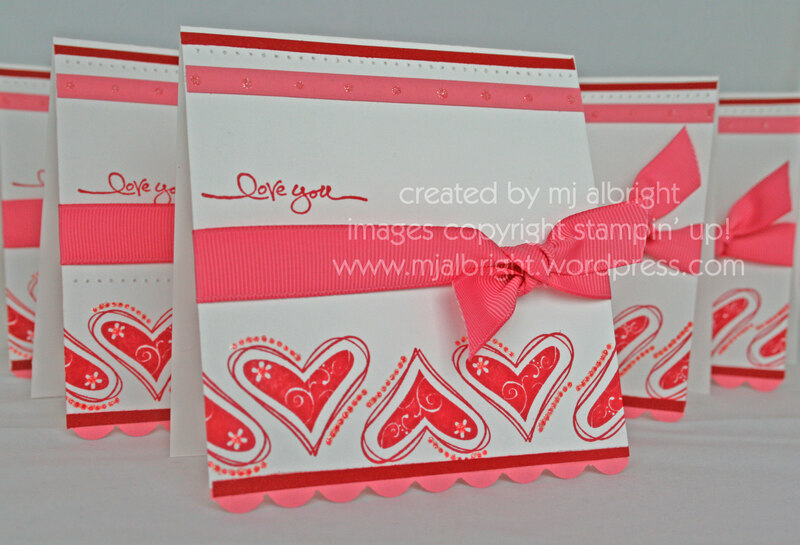 These cards where made to be sent overseas so soldiers have Valentine’s cards to send home to their loved ones. You can find out more info –>here<– on Beate’s blog…you have to act fast. I made these this am and it only took about 1hr. I was told to “keep it simple”, so here is what I came up with. I had to add some details because the card base is Whisper White and it needed a little dazzling. ACCESSORIES USED: Regal Rose 5/8″ Grosgrain Ribbon, 3/16″ Corner Rounder Punch, Crafters’ Tool Kit (paper-piercing tool & template), Stamp-A-Ma-Jig, Cotton Candy Stickles. I thought I would take the card I made for Beate’s wsc32, in the post below this one, and combine it with her Wednesdays tutorial on SCS for making a pull treat pouch . I’m going to do this every friday. I will be posting a sample for her sketch..and later in the day, I will post a coordinating project from her SCS tutorial (good way to get things done I think). There will be a “Part I” and a “Part II” to showcase. How cute of a Birthday gift to give to someone. 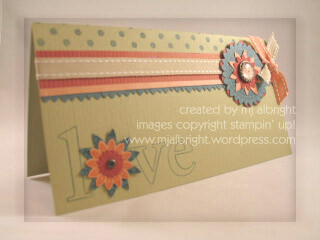 I used all the same supplies, CS, DSP as I did for my card sample here. It is true what they say….”the Hershey Bars do taste better where I live.” I’m only about 10 minutes from Hershey, PA and lovin’ it. The candy bars are “fresh”. I’m not originally from this area (shout out to all yinz in the “Burgh” – Pittsburgh, PA that is. *wink* to Charmaine). So, I really enjoy spending weekends at Hershey Park and just in that area (I frequent a scrapbooking store at the Hershey Outlets…oops, hope hubby isn’t reading). Thanks for stopping by and for all the information provided on my computer problems. It’s Friday and that means it is time for Beate’s wsc. 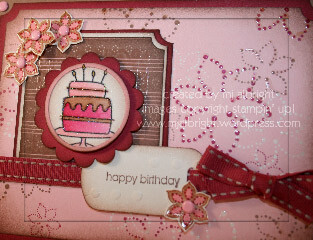 I HAD TO USE the cute little cake image from Bitty Birthday stamp set (such a cute little inexpensive set from Stampin’ Up! 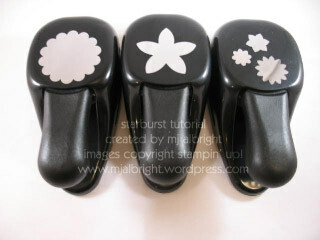 ), but I’m just not sure about combining it with the dotted flowers. Oh well. I’ll have a b-day card handy. Oh the details that are hard to see. I applied Crystal Effects all over the place; to the dotted flowers on the Berry Bliss DSP, to the cake icing, and to the punched out little flowers. For the main cake image — stamped first with Stazon Jet Black ink on Shimmery White CS. Used Aqua-Painter with Close to Cocoa, Purely Pomegranate, and Pretty in Pink ink to color. Then, I restamped over the image (with the help of the handy Stamp-A-Ma-Jig) with Versamark Ink, applied Heat & Stick Powder, heated to set, applied Iridescent Ice, heated to set again. 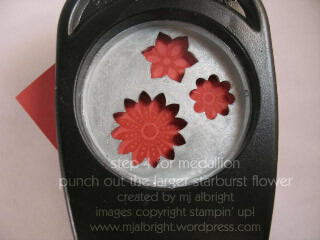 Punched out with a 1-3/8″ Circle Punch and applied with Stampin’ Dimensionals to a piece of Purely Pomegranate CS that I used a Scallop Punch to. I added a small Pretty In Pink CS trim to the Shimmery White CS circle that was created with a 1-1/4″ & 1-3/8″ Circle Punch. upclose to show colored-in ribbon, cake, and DSP flowers. 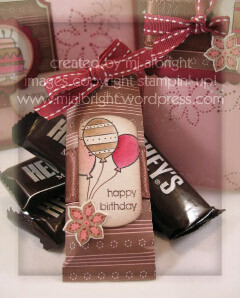 Sentiment, “happy birthday”, stamped in Chocolate Chip ink on Shimmery White CS and punched out with a Key Tag Punch. 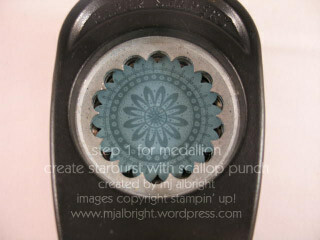 Used Crop-A-Dile tool to add some dry embossed circles. Used horizontal Slot Punch so I could thread Purely Pomegranate Dbl-Stitched Ribbon through and tie in a bow. 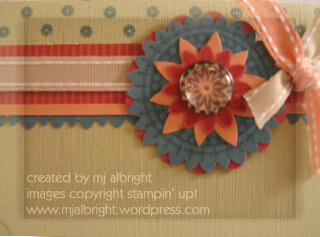 I used a Close to Cocoa Stampin’ Write Marker to color the white stitching of the ribbon. The four little flowers are from One of a Kind stamp set that everyone is using right now:) I wanted these flowers to coordinate with the Berry Bliss DSP. 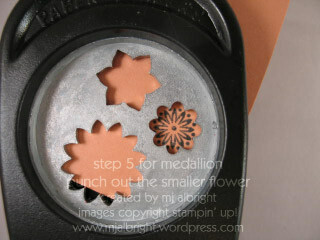 I stamped them in Close to Cocoa ink, colored in the petals with a Pretty in Pink Stampin’ Write Marker. 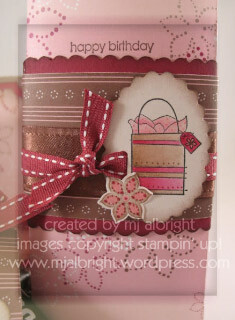 Used a Rose Red Stampin’ Write Marker to add dots similar to those on the Berry Bliss DSP. 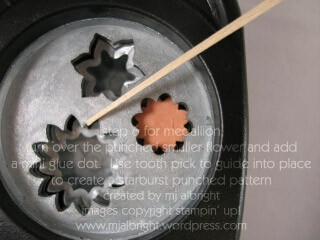 Covered all the brown parts of the petals with Crystal Effects. Finished them off by adding a pink brad from Soft Subtles Brads Assortment. 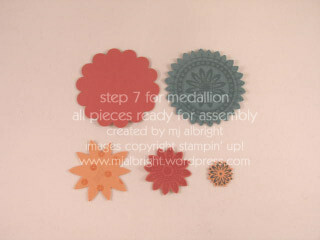 Attached with Mini Glue Dots and Stampin’ Dimensionals. All pieces of CS and DSP have their edges sponged with Close to Cocoa ink. I used a Ticket Corner Punch to all the corners. 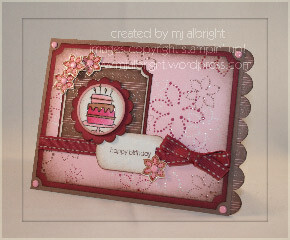 Added more pink brads to the four corners of the card base. I also needed something to match the DSP behind the main image…so I added a scalloped strip to the right of the card that I created with a Slot Punch. I may have to take the weekend off from blogging…I work a 12hr night shift tonight, finished up a wedding invite package, AND I RAN OUT OF SPACE ON MY COMPUTER….I have to backup pics to disks and somehow restore some memory (or go buy more). I have Photoshop and I keep getting a pop up that “scratch disk is full” and all sorts of memory/drive stuff that I know nothing about. Can you say Geek Squad to the rescue. If you have any tips on how to organize and back up precious & priceless pics, I would be happy to hear from you. See, with having to create scrapbook pages (okay, not that often), I have to constantly see the pics. I’m afraid if they are not on my computer, for me to see, I will forget about them. Or, how am I supposed to remember which disk I saved it to? Okay, I’ll confess….I’m up to like 5000+ pics that I have to somehow create a library for. And I hear it is time consuming. I can’t be the only one who is hesitant to hit the DELETE BUTTON. Or am I??? I met with some stamping friends of mine this evening for a post-poned christmas party. It was nice to get out of the house and communicate with other women (and stamp). I had to take along a gift to exchange and a swap card to make. I started with a So Saffron CS base and used Bali Breeze DSP folded in half (place crease of fold to left side of card with opening to the right of card) to create a belly band. 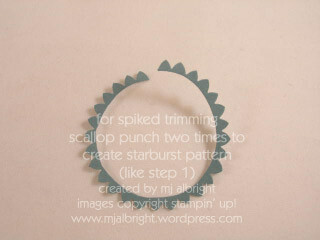 I used a 1-1/4″ Circle Punch to the right side. Stamped floral swirls/leaves from Stitched Exotics Stamp Set in Old Olive ink. Tied Old Olive 5/8″ Grosgrain Ribbon in a knot around the belly band. Flower image from Stitched Exotics Stamp Set as well and stamped on Rose Red CS with Rose Red ink two times. Cut out the first flower and adhered to the belly band. 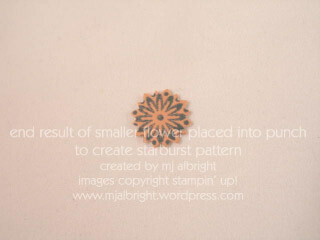 The second one, I punched out with a 5-Petal Flower Punch; added a new Flower Fusion Accents & Elements orange flower to the middle; attached a Silver Brad; attached Stampin’ Dimensional to the back of this flower and placed on top of the first cut-out flower. 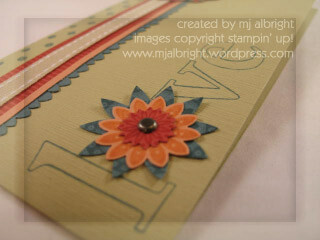 Stamped some swirls (from Stitched Exotics) to the top and bottom of the card in So Saffron ink. 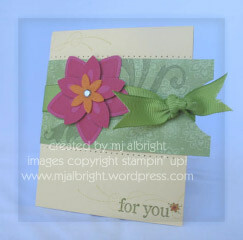 The sentiment, “For You”, is from One of a Kind Stamp Set. I stamped it in Old Olive ink and colored in the tiny flower image with a Pumpkin Pie and Rose Red Stampin’ Write Marker. For the paper-piercing, I took off the belly band and only placed it on the card front (lay the card flat). Now you have a guide where to paper-pierce. Using paper-piercing template and tool from Crafters’ Tool Kit, I created the horizontal piercing above and below the belly band. Really simple card to make. 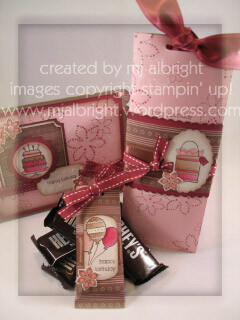 Can’t go wrong with Chocolate’s as a gift. 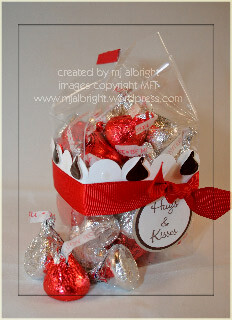 I wrapped the chocolates inside with Berry Bliss DSP. I used One of a Kind Stamp Set for this project. 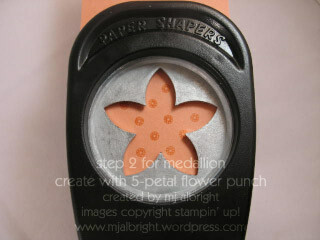 I stamped the flowers to the Acetate sheet with White Opaque StazOn ink. 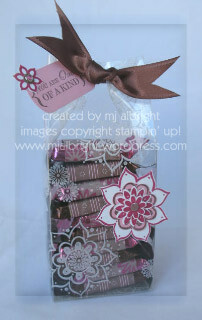 The sentiment was stampin in Chocolate Chip ink on Pretty in Pink CS. Punched out with Key Tag Punch. Stamped the large and 3 small flower images in Purely Pomegranate ink on Whisper White CS..cut out large one and punched out smaller ones with Boho Blossoms Punch. 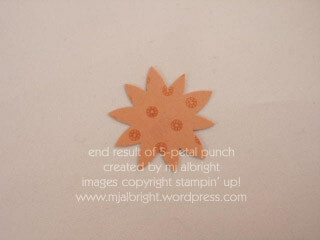 Restamped the large flower in Chocolate Chip ink on Pretty in Pink CS and cut out. 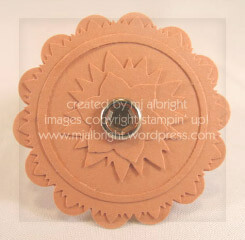 Used 1/4″ Circle Punch to Close to Cocoa CS and added to middle of large flower and small flower to tag. 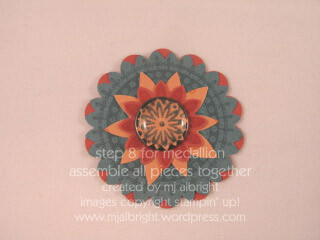 Added a pink Fire Circle Rhinestone Brad to tag flower. Punched holes in top of gift wrapper and my tag. 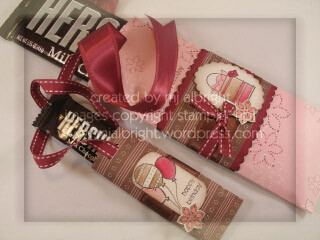 Threaded Chocolate Chip Satin Ribbon through the holes and tied in a knot. 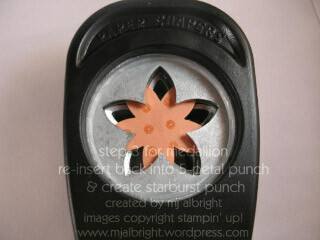 While at the get-together, I had the opportunity to play around with punches again. Here is a medallion I made this evening. Thanks for stopping by. Hope everyone had a wonderful weekend.